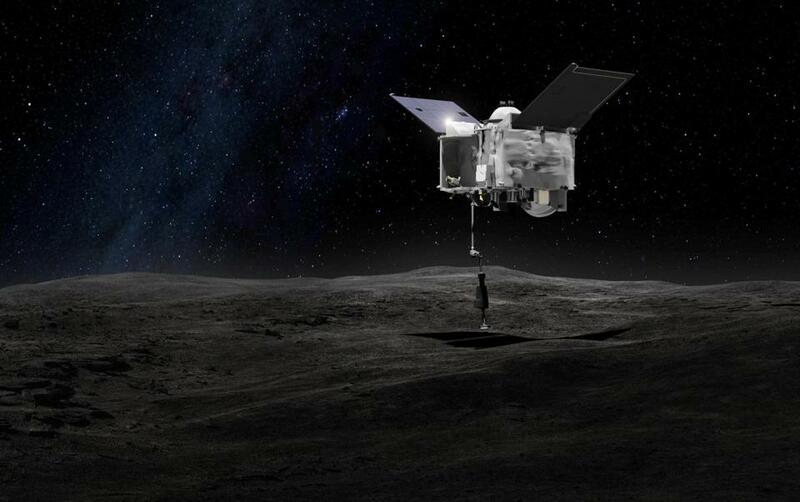 An artist&apos;s rendering of the Origins Spectral Interpretation Resource Identification Security - Regolith Explorer (OSIRIS-REx) spacecraft contacting the asteroid Bennu. Satellites are lonely objects, orbiting through cold dark space all on their own. If the future holds, however, they’ll soon have companions. This is the vision of researchers who are engineering satellites that can work together to perform functions no one satellite could handle on its own. These initiatives range from pairs of cubesats that can dock with each other to mass deployments of palm-sized satellites. Distributed satellite systems, or swarms as they’re popularly known, have two advantages over traditional satellites. They’re far smaller and cheaper and can take on missions that would be too risky for a billion-dollar spacecraft. One especially ambitious project is called KickSat, which is led by Zac Manchester, a postdoctoral fellow in the Agile Robotics Lab at Harvard. Over the past six years (and with some help from Kickstarter funding), Manchester and his colleagues have engineered satellites called Sprites that are preposterously small — square devices 3.5 centimeters on a side that weigh less than 5 grams and cost about $25. The devices resemble circuit boards in a smartphone and are packed with a solar panel, a tiny computer, a radio transceiver, and sensors like a gyroscope. Despite their size, they've already proved their durability on a three-year-long stint anchored to the outside of the International Space Station. Manchester plans to launch the Sprites in groups of 100 or more from a “mother satellite” in low Earth orbit, potentially on a NASA mission within the next six months. Once released, they’ll fan out along an orbital line and take snapshots of a huge swath of the upper atmosphere that’s too high to be studied by weather balloons but too low for conventional satellites. Manchester envisions taking the technology on more adventurous operations.